Chances are you have already learned what Frequency Separation (FS) technique is, as it became mainstream in the past few years. However, many FS technique users actually know very little theory behind it, thus have little control over its implementation. I've set out to research and collect all the important and useful information about it, so we can together learn how to become better at it. After we look at the slightly geeky results of my research (my sources at the end of this article), I would also like to share with you a few practical ways of its smart implementation with the help and advice from my friends: commercial photographer from Moscow, Aleksey Dovgulya (you may remember Aleksey from my Shooting With Mixed Studio Lighting article) and Toronto-based photographer & retoucher Michael Woloszynowicz. Frequency Separation technique is virtually a process of decomposing of the image data into spatial frequencies, so that we can edit image details in the different frequencies independently. There can be any number of frequencies in each image, and each frequency will contain certain information (based on the size of the details). Typically, we break down the information data in our images into high and low frequencies. Like in music any audio can be represented in sine waves, we can also break up an image into low and high frequency sine waves. 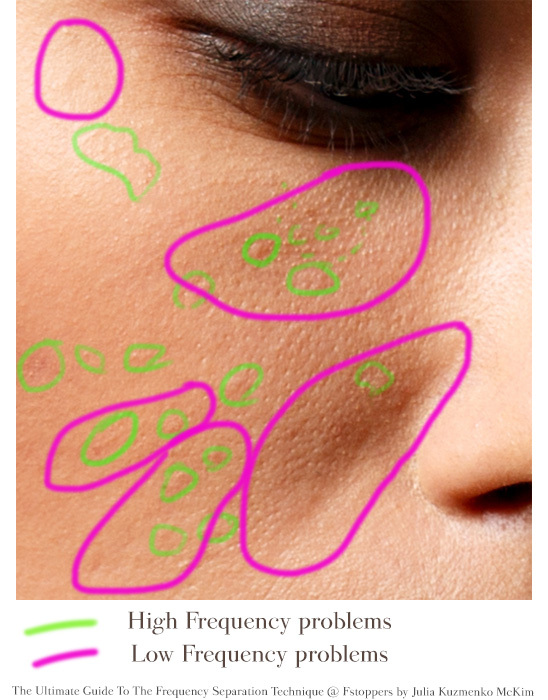 High frequencies in an image will contain information about fine details, such as skin pores, hair, fine lines, skin imperfections (acne, scars, fine lines, etc.). Low frequencies are the image data that contains information about volume, tone and color transitions. In other words: shadows and light areas, colors and tones. If you look at only the low frequency information of an image, you might be able to recognize the image, but it will not hold any precise detail. You may have seen this optic illusion that exploits the frequency separation principle. If you look at this image from a normal distance from your computer while reading this article you will see Albert Einstein's photo. Now, get up and walk away from your screen. Look again. Who do you see now? 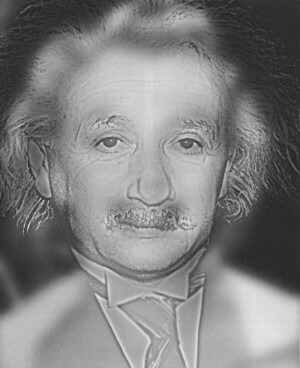 Essentially, this image is a combination of photos of Marilyn Monroe in the low frequency layer and Einstein's in the high frequency layer. 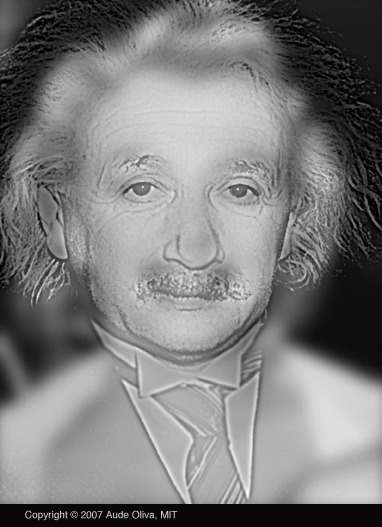 When you look at the image from a close distance you see the high spatial frequency image (Einstein), the fine details, the outlines of his facial features. Once you walk away, your eyes will adjust - the "low pass filter" of your vision will kick in - and you will see the low spatial frequency image (Marilyn Monroe). Within the digital photography editing craft, the separation of spatial frequency data in images can be utilized for skin (and not only) retouching. 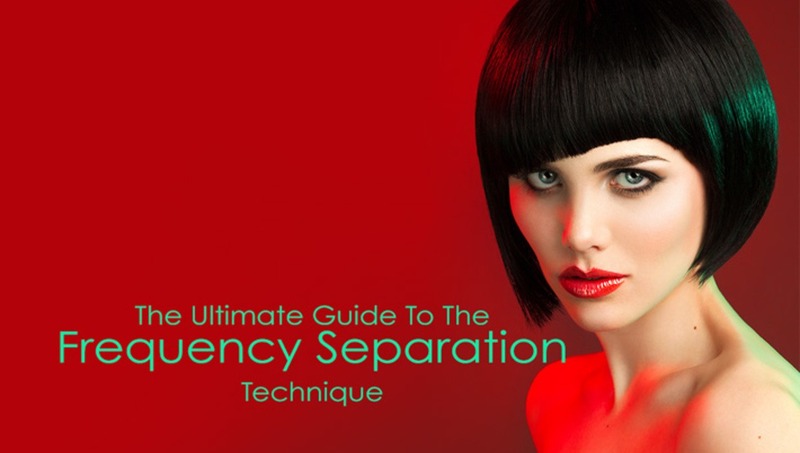 While there are a number of ways to implement the Frequency Separation technique, the steps you take to get to the final result will define the amount of time spent and the quality of the outcome. Before we begin, I want to make a quick note regarding the use of the High Pass filter in the FS technique. When it is used to separate the image into high and low spatial frequencies, the results are inaccurate. In other words, after the separation your image data is slightly skewed, so you compromise the quality of the outcome before you even begin retouching. But! That inaccuracy is mainly affecting the pixels with extreme brightness, and when used smartly, it can actually be beneficial to the outcome in some situations. I will talk about this later. Let's first talk about this more accurate algorithm. 1a. Duplicate your Background layer twice: the top layer is the base for the high frequency image data and the bottom duplicate is for the low frequency image data. 1b. 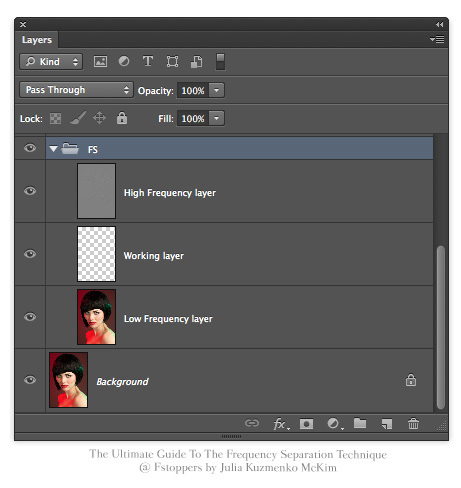 Turn off the visibility of the High Frequency layer and select the Low Frequency layer. 2. With the Low Frequency layer selected, run the Gaussian Blur filter and choose Pixel Radius with which all the fine details will be blurred. We turn off the visibility of the High Frequency layer, so that we can better see how our choice of Pixel Radius affects the entire image. After you've applied the Gaussian Blur filter, turn the High Frequency layer's visibility back on. 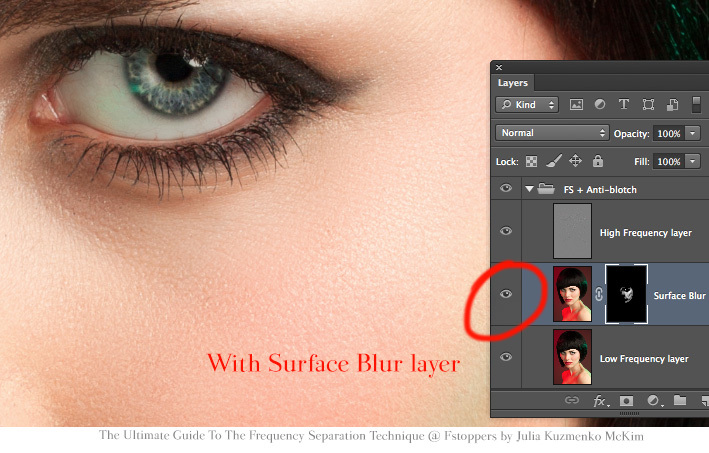 Note that in the Layer dialog you will need to select the layer that contains your Low Frequency (blurred) image. In my example it is called just that "Low Frequency layer". 4. Now change the Blending Mode of the High Frequency layer to Linear Light and your overall image will look exactly as before you started the separation. You're set up. I usually also group these two layers, so my Layer stack is more organized. From this point on, every retoucher and photographer chooses his or her preferred tools to work their magic. Basically, we aim to soften and even out color and tone transitions on the Low Frequency layer, without affecting skin texture, which was captured and preserved on the High Frequency layer. You will normally hear that the Clone Stamp tool or the Healing Brush tool with Current Layer Sampling setting and very low Hardness are the tools to work on the Low Frequency layer; the same tools only with very high Hardness settings are your High Frequency layer tools. Check out my old video where I only used the Healing Brush tool. I've changed my ways drastically since then, but we'll talk about that later. The goal of this video was to show how fast this technique can be, so you will see a countdown clock at the top of my screen - 25 minutes, boom! Note: I named the High Frequency layer "High Pass - texture" in the video, which is incorrect, because I was actually using the Apply Image setup. Well, live and learn! If that's all you've been doing so far, let me share a few more strategies that I've learned from my own experience and from my talented friends. We all love experimenting and coming up with new ways to use ordinary tools and techniques, so here's what we've come up with so far. High Pass filter setup for the Frequency Separation technique isn't all that bad, and shouldn't be completely written off as an inaccurate way to separate spatial frequencies. As I mentioned before, when High Pass filter is applied to the High Frequency layer in place of the Apply Image function, it gives you an imprecise final image where the brightest pixels are usually grayed out. According to my friend Aleksey, it actually plays out well when you are retouching skin with a bit of overexposed highlights on it. They get toned down and the skin looks more matte as a result. Other parts of the photo where you wouldn't want the highlights to be muted down (such as specular highlights on the lips, catchlights in the eyes, etc.) can be easily covered up with a Layer Mask. Aleksey also insists that it's a very quick method, and should be used along with the Apply Image FS algorithm when appropriate. He explains that using the High Pass filter gives you more control in deciding what information belongs on the High Frequency layer and what should be blurred out on the Low Frequency layer. This way, after you've performed the separation, your further retouching should be much faster and precise. Here's how Aleksey explains how he selects the correct High Pass radius. For example, we've got this photo to retouch. There are some problems that should be taken care of on the Low Frequency layer such as shadows, larger areas of colors and tones that we need to soften or remove. On the other hand, there are also little blemishes on the skin texture, which should be handled on the High Frequency layer. To separate spatial frequencies with the High Pass filter, we need to create two duplicate layers, just like in the Apply Image approach. The top layer will contain our High Frequency image data and the bottom layer will be our Low Frequency layer. We select the High Frequency layer, apply the High Pass filter to it (Filter > Other > High Pass) and slowly move the Radius slider from zero up. At this point, we need to figure out how much fine details will be taken to the High Frequency layer, and what will be smoothed out on the Low Frequency layer. As soon as we start seeing excessive tonal transitions, bulky textures and volumes we should stop - that will be the limit of what goes onto the High Frequency layer. 2px Radius isn't enough because it barely picks up any texture, and we're risking to leave important fine details out. At 7.8px Radius we're starting to see what we don't want to go onto the High Frequency layer - excessive tonal transitions and volumes - so we have to go back down. And at 3.5px Radius we get the right amount of fine details, so this will be the number we select. Click OK, and then change the High Frequency layer's Blending Mode to Linear Light and Opacity to exactly 50%. Now turn the visibility of the High Frequency layer off, and apply the Gaussian Blur filter to the bottom layer - Low Frequency - with the same Pixel Radius we have just selected in the High Pass filter dialog. Turn the visibility of the High Frequency layer back on, and we're ready for retouching. On the Low Frequency layer you can use either the Healing Brush (very soft, Sampling set to Current Layer), Clone Stamp (very soft, lower Opacity, Sampling set to Current Layer) or Simple brush tool to even out colors and tones. I personally have recently found that working with a simple Brush on lower Opacity works the best for me. I do sometimes still use the Healing Brush tool, but I never use the Clone Stamp tool on the Low Frequency layer. On the High Frequency layer you can use all of the same tools, only your brushes and the Clone Stamp tool should have higher Hardness settings and higher Opacity percentage. I personally prefer the Clone Stamp and hard Healing Brush tools for working on the High Frequency layer. Those tools help me to avoid smudging and softening skin texture. I highly recommend trying all of the mentioned above tools and figuring out in what situations what tools work best for you. According to my crafty friend, this skin retouch took him only a few minutes because the frequency spatial data of the image was properly separated. All the texture remained intact on the top layer - High Frequency layer - and the colors and tones were quickly evened out underneath it. 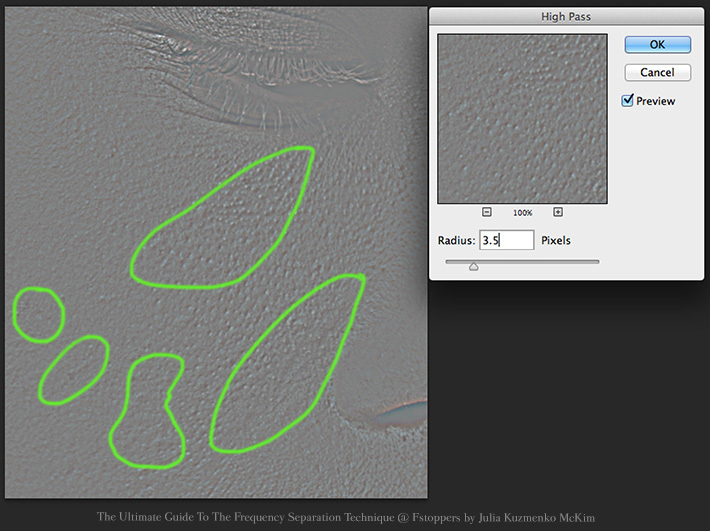 "The Apply Image and High Pass approaches of separating frequency spatial data of an image are the two main ways of how I use the FS technique," says Aleksey, "Apply Image setup is more accurate, but the High Pass setup is quick and helps me to not only customize the separation of skin texture from underlying colors, but also tone down "hot" highlights on the skin. I always go for the High Pass setup when I need to do a quick retouch, especially when evening out skin. It is really helpful to be familiar with and practice both approaches." 1. Aleksey uses an additional empty layer that he adds in between the High and Low Frequency layers. When you're working on a separate layer to correct the Low Frequency data, you're not messing up the existing pixels on the Low Frequency layer. You can always either erase your mistakes or hide them with a Layer Mark and not rely on the History Panel states. This good habit may save you a lot of time in the long run. After you've evened out the shadow and color transitions, you can apply Gaussian blur to this working layer to soften your own brush strokes and make the colors blend with the rest of the image even better. This is what Aleksey does, and I have tried it a few times already - works like magic! Each image will require a different pixel Radius, so practice more to see what degree of blurring works in different retouching situations. 2. Removing skin blotchiness with the Surface Blur filter. While the Threshold slider is at its minimum position, move the Radius slider to where you want it to be (depending on the amount of blurring that you need). Then cover this layer with a black Layer Mask and paint with a white soft brush (low Opacity) over the areas where you need to kill skin blotchiness. This method is super quick and can be used as the preparation step before you get down to retouching. It very well maybe the only step that you need if your model’s skin is already well-prepared for the shoot, i.e. great makeup and skin to start with. 3. 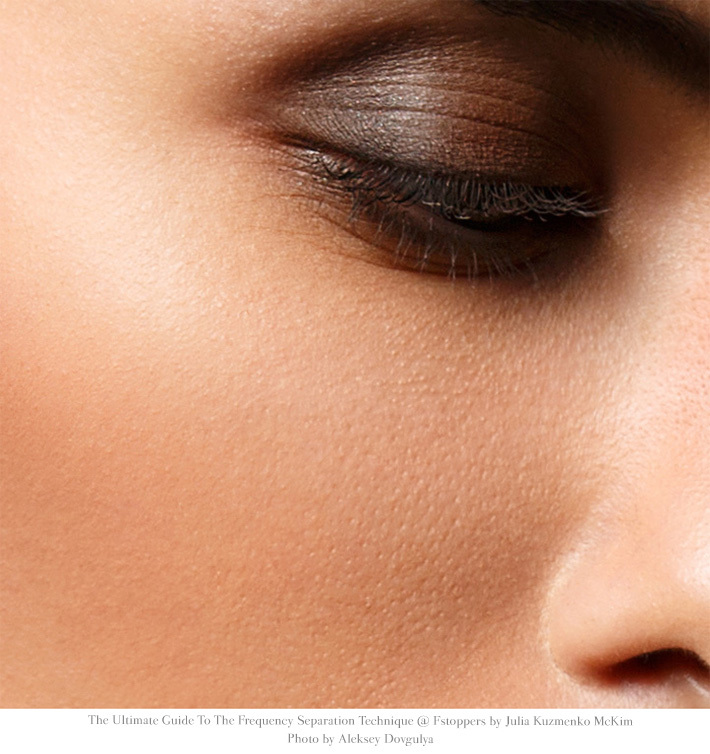 Don't try to retouch the entire face with just one round of Frequency Separation. 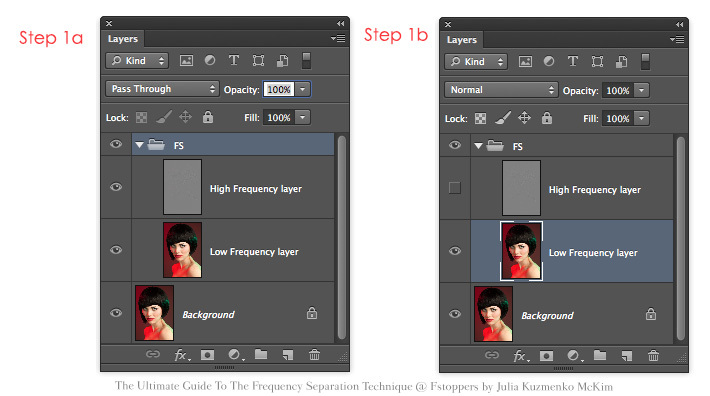 Set up High and Low Frequency layers as many times as you need to solve problems in your current retouch. I personally do at least 2-3 rounds of Frequency Separation, and I also Dodge & Burn the problems that remain. Aleksey suggests that the best results can be achieved when you create custom High and Low Frequency layers (just like he showed us earlier) for each part of the face that needs doctoring. Your Radius settings for the High Pass and Gaussian Blur filters most likely will be different for each part of the face. It is a little more elaborate approach, but custom settings will help you achieve the best results for each part of the image. 4. 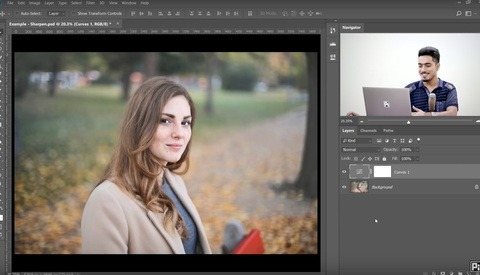 Make sure to practice using different tools for different retouching problems. Remember, than you can use the Clone Stamp, Healing Brush tools and a simple brush to fix skin problems on the Low Frequency layer, as well as on the High Frequency layer. Watch the Hardness and Opacity of the tools, and the Sampling settings should always be under control as well. Each of these tools will be helpful in some situations, so you shouldn't pick up just the one tool you prefer for everything. Try and practice working with each one of them and see where and when they give you the best results. 5. Create or download an Action. I personally use custom settings for the High Pass setup, so I don't need an Action for that. But in many situations, when the subject's face is not very close to the camera (the skin texture doesn't require a lot of doctoring) I use a Frequency Separation Action that I recorded for myself. I mainly work in 8-bit color depth, so my action is for 8-bit images. You can break it down and re-create one for 16-bit photos using the settings I've mentioned above. You can download my Frequency Separation Action along with a handful of useful beauty retouching Actions from my blog (in the sidebar). 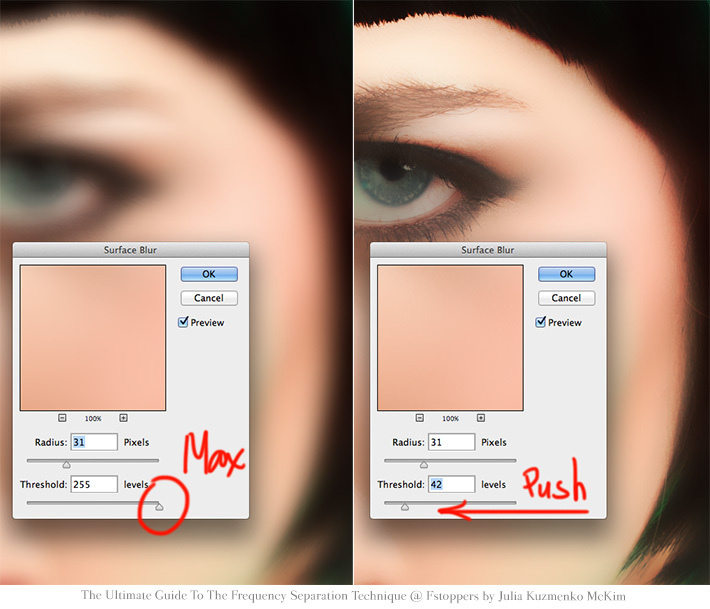 Another trick that I came up with in my experiments is enhancing skin texture by duplicating the High Frequency layer. I usually first fix all the most visible blemishes on the original High Frequency layer, then duplicate it and cover with a black Layer Mask. I then paint with a soft white brush (low Opacity) over the areas where I want the texture to be a little more pronounced. You can control the intensity of the sharpening with this duplicate High Frequency layer by lowering the Opacity of your white brush as well as lowering the Opacity of the duplicate layer itself. To make it even more fun, you can actually borrow parts of the High Frequency layer with the more pronounced texture and apply them to the areas where the texture is too soft or has been destroyed by your previous manipulations, suggests my friend and fellow-photographer and retoucher Michael Woloszynowicz of VibrantShot.com. He also mentions that he uses the Free Transform tool to re-shape those pieces when the skin texture direction or forms don’t match those of the areas, which they are applied to. 7. I almost always mix and match the Frequency Separation technique with Dodging & Burning. There’s no one right way as to what technique should be used first and how many rounds of each should be applied. I sometimes start with the FS technique and finish up evening out the skin with Dodging & Burning. Sometimes it makes sense to soften large shadows with Dodging first and then only retouch skin texture on the High Frequency layer. It’s always different because every image is unique. But it will definitely help to know and practice both techniques, so that you can easier determine which one will solve the problems you stumble upon better. "I typically use the FS technique for color changes and Dodge & Burn for luminance changes. If you try to make drastic luminance changes with FS, I find that it can reduce texture as your new tones will blend with the light or dark tone of the High Frequency layer. Dodging & Burning, on the other hand, will darken or lighten both the high and low frequency data, thus avoid this issue," says Michael Woloszynowicz. That's all for today. I am sure there are many more additional tricks that can be used with the Frequency Separation technique, so if you know any - please share with us in the comments! A Model Mayhem post by Sean Baker. A Model Mayhem post by grahamsz. And of course, thanks again to my photographer-friends Aleksey Dovgulya and Michael Woloszynowicz for sharing their methods and tips with us! Aleksey is coming to Los Angeles in January 2014, so we can finish our Beauty & Fashion Photography: Go Pro digital book - check it out and sign up for our newsletter to get notified when it's ready! hands down the best articles on Fstoppers are from Julia!! She is without doubt the most important figure on Fstoppers for quality content right now. The skill level and experience she shares is worth money and she does this for free. Kudos Julia. What a great help this is!!! thank you!! Just recently discovered this technique... still trying to get a feel for it and this article helps a ton. Thanks!!! Amazing Article Julia!! Thanks for all the time you put in to this! So valuable! excellent post! thx for sharing! Best article on Fstoppers!! Thank You, seriously! Toasting an Elysian IPA to you as I write this! ++ Ya Russkiy! What I love about Julia's articles (as well as her ebook) is how she manages to stuff so much information in her texts that you gotta read at over and over again to absorb it all hahahaha THanks Julia! Awesome article, well written and easy to follow even for ADHD'ers like myself! Nice job! julia thank you very much for this. Hi Julia. I have read that using different blurring techniques can produce more accurate frequency separation results. Two alternate that I know of is Surface Blur (takes way too long to render) and Dust and Scratches (the method that I use). Hi Joe, thank you for sharing this! I've never heard of the variations you've mentioned, but I am intrigued and will definitely check them out. My goal is always to simplify and speed up my workflow, so whatever is more time-consuming or complex to implement (considering the degree of improvement of the outcome) never sticks. But I am always eager to check new things out, so really thanks for the link and suggestions! Hey Joe, just to let you know that sometimes, changing your image to 8 bit can speed up the render with Surface Blur. Image&gt;Mode&gt;8 bit in the top menu bar. Though I'll happily concede there are exceptions to every rule, converting to 8-bit during the editing process is likely a false economy. On the other hand, if you're already working in a scenario where you have this option, you'll probably be aware of this... Just have to call it out as I'll always work in 16-bit+ if possible. Of course, if your image size is too large for your machine to handle the fine-tuning with any reasonable speed, one can convert to 8-bit to dial-in values before reverting/undo to 16-bit and plugging in the values that you settled on. Just remember that 16-bit to 8-bit is a one-way trip! Bookmarked and shared!! Thanks very much! Hands down the best guide I ever read about FS. You even use samples from Natalia Taffarels Workshops and dont mention her name??? I am not sure what exactly you mean, Stephan, all my sources are mentioned at the end of the article, and the screenshots are taken by me and Aleksey Dovgulya. Perhaps, you could share a link to what samples you are referring to. Just FYI, if I used anything from Natalia Taffarel's workshops, I would make sure to mention it. I am an artist and respect copyright laws and work of other artists. And Stephan chickened out... Where is the evidence, Meier? I think he's referring to the Einstein/Monroe illusion which he thinks she created for a workshop. A video is found here and the image appears around the 3 minute mark. Luis, I don't think Natalia created it at all - here's a copyright note: http://media.tumblr.com/tumblr_lj6q1kbiNV1qhpjx7.jpg - my bad I didn't find this earlier. I think we are all in agreement that this is one hell of a great write up. Thanks Julia. Thank you for this. This article is like a Swiss army knife with it's thorough usefulness. Haha, cool analogy! Thank you Nick! Awesome info! I gotta try this out.